"Introducing 90% of Python Course"
In addition to some consulting work and catching the tail end of spring skiing, I've been working hard. 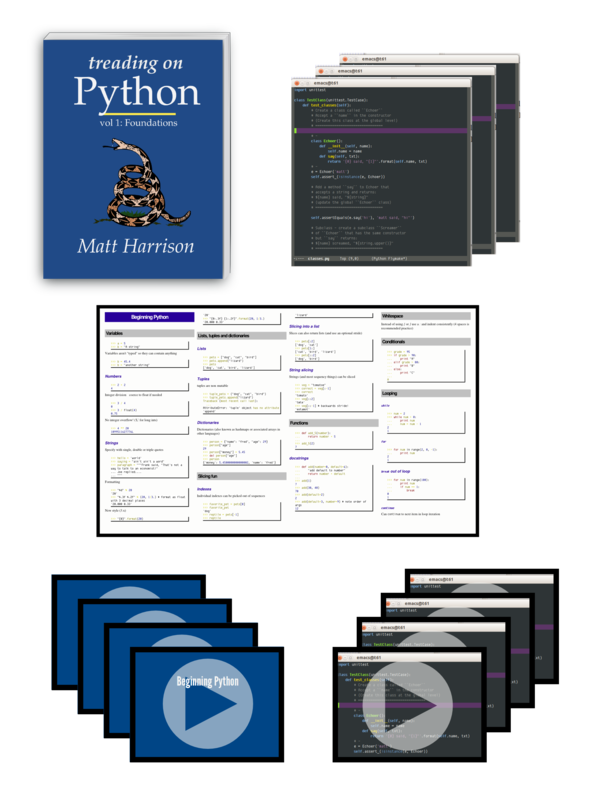 Early next month I will be selling a course-90% of Python. Why 90%? I want 100%! Python is very broad. The intent of this course is to present the language, nuance, and best practices around Python such that you can go out and read and write Python. Then there is a huge standard library, third party packages, fancy constructs such as metaclasses, decorators, and generators, C integration (Java/C# too), web development, scientific applications, thick clients, automation, and more ... This course will provide a foundation for the rest. Covering the rest could take quite a bit of time, but with the basics you can be productive quickly. In addition to individual licenses, there will be a 2-Pizza license (for teams the size that Jeff Bezos recommends). If you want your team to be on the same page, let your boss know to pick up a team license. I will offer a promotion during the launch only, sign up on the landing page to receive the discount code.